Music director Frank McNamara has developed a solution to help all second-level students improve their exam performance whilst embracing their addictive mobile phone habits. The result is a new mobile learning service called SMS Tutor, the world’s first mobile learning system. 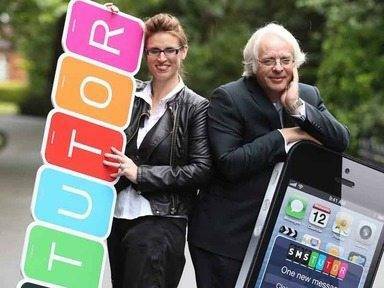 SMS Tutor has developed an innovative and smart form of mobile learning using SMS messaging that provides students with daily curriculum content in the run up to their Junior or Leaving Certificate. It enables students to learn something new every day by receiving bite-sized course content via SMS relating to a subject of their choice. One of the many benefits of SMS Tutor is to improve a student’s focus by enhancing and reinforcing formal school teaching rather than replacing it. SMS Tutor commissioned educational psychologist Deirdre Griffin to ascertain the effectiveness of SMS Tutor on learning and recall. The results of the research showed that: participants who only received SMS Tutor’s texts achieved very significantly higher results on 14 facts tested; the difference in scores for those who received SMS Tutor texts to those who didn’t is comparable to a C3 to B1 grade improvement at Leaving Certificate level; the results of the participants who received daily texts averaged a score of 40pc higher than their counterparts who did not receive any texts on the 14 fact based questions; and on the more detailed bonus questions completed, recipients of texts achieved results four times higher than the group that received no texts. “Smartphones are beginning to transform how we engage in our everyday lives. Smartphone penetration is constantly growing with over half the population of Ireland owning a smartphone. I began to notice that mobile phones were interfering with my kids’ study, so instead of fighting it, I decided why not embrace it?” said McNamara. Students will have the opportunity to sign up for a text a day for the entire school year for €40 per subject for the academic year. Launching in September 2014 the service provides every subject from the school year at a cost of €5 per month per subject.